Residents in New York who struggle with alcohol addiction or who have loved ones with an alcohol drinking problem can access quality professional care and counseling services by calling any of these alcohol problems helplines. Delphi Health Group connects callers to professional care and also provides alcohol abuse counseling and treatment advice. The treatment options services provided are covered by insurance and calls to the alcohol emergency hotline are free and confidential. Call Delphi Health Group on (866)-520-2708 anytime, any day, to speak to a representative. Call New York State Hopeline on 1-877-8-HOPENY to get treatment advice on alcohol addiction and referrals to alcohol rehab centers certified by the New York State’s Office of Alcoholism and Substance Abuse Services. Calls to this free helpline for alcohol are confidential and anonymous. Call, text, or chat with an NYC Well representative for counseling and treatment advice on alcohol addiction and abuse. Callers get access to alcohol and substance abuse services. Also, NYC Well offers services for people with mental health problems such as depression. For English, call the alcohol addiction hotline number 1-888-NYC-WELL (1-888-692-9355), press 2. For Espanol, call 1-888-692-9355, press 3. Individuals who are hard of hearing or deaf can call 711 to speak to a representative using video relay services. Call this national alcohol abuse hotline on 1-800-622-2255. The representatives connect people to more than 90 rehabilitation centers affiliated to the NCADD. 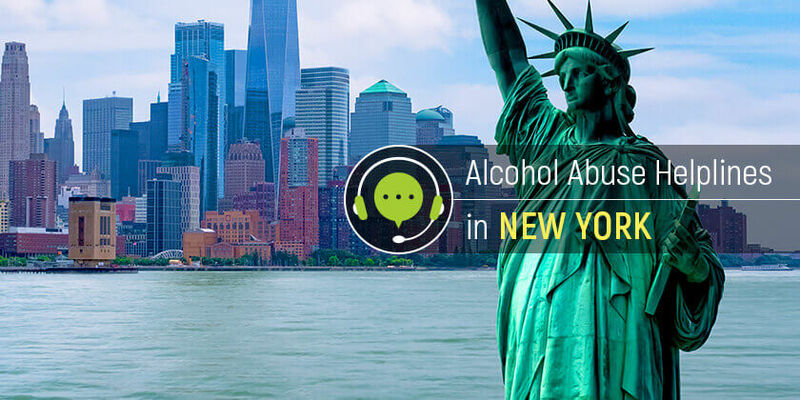 New York residents with alcohol problems can access quality treatment and recovery programs and facilities by connecting with professionals through any of these alcoholism treatment helplines.